Here is a little treat to have with your afternoon coffee. Biscotti is a twice-baked Italian biscuit (cookie) which has a crunchy texture, making it perfect for dipping into a cup of hot coffee. 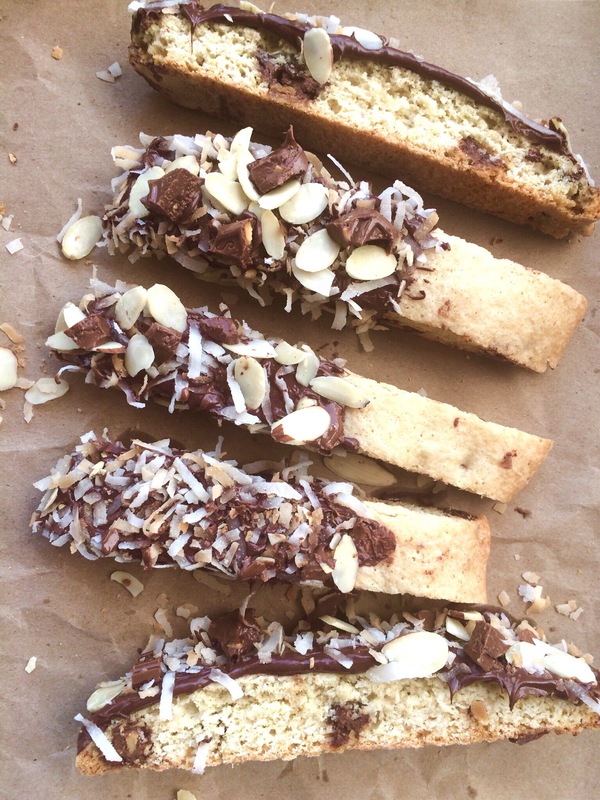 Making biscotti is a little different than making regular drop cookies. Instead of dropping the cookie dough on a baking sheet, you shape it into a cookie loaf and bake it. Once baked, cut the cookie loaf into slices. Bake the slices and that’s it! I chose to dip my biscotti in melted chocolate. 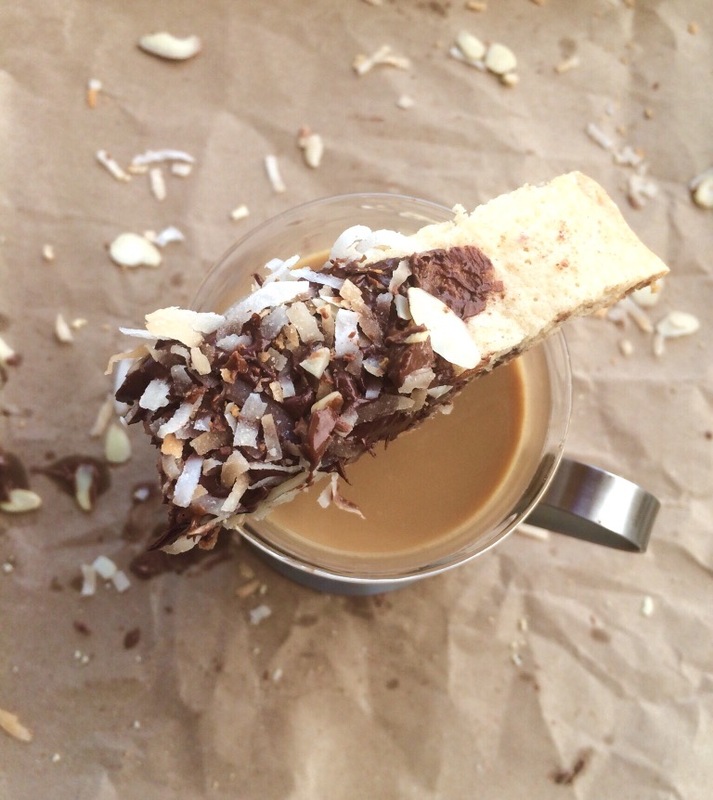 Then I packed on tons of toppings: toasted coconut, chunks of almond milk chocolate, and sliced almonds….no boring biscotti here! In a large bowl, mix together oil and sugar until well blended. Add in vanilla and almond extracts, then beat in the egg. In another bowl sift together the flour, salt, and baking powder. Gradually add the dry ingredients to the wet ingredients. Stir in chopped chocolate. Place the dough onto a baking sheet lined with a silicone baking mat. Cover your hands with flour to help shape the dough because it’s very sticky. Shape the dough into a loaf. Bake for 35 minutes or until light brown, check to see if it’s done by inserting a toothpick in the center and it comes out clean. Let the loaf cool on the baking sheet for 10 minutes. Cut the loaf diagonally into about 1-inch thick slices. Lay the slices onto a silicone lined baking sheet. Bake for an additional 10 minutes, flipping the biscotti halfway through. 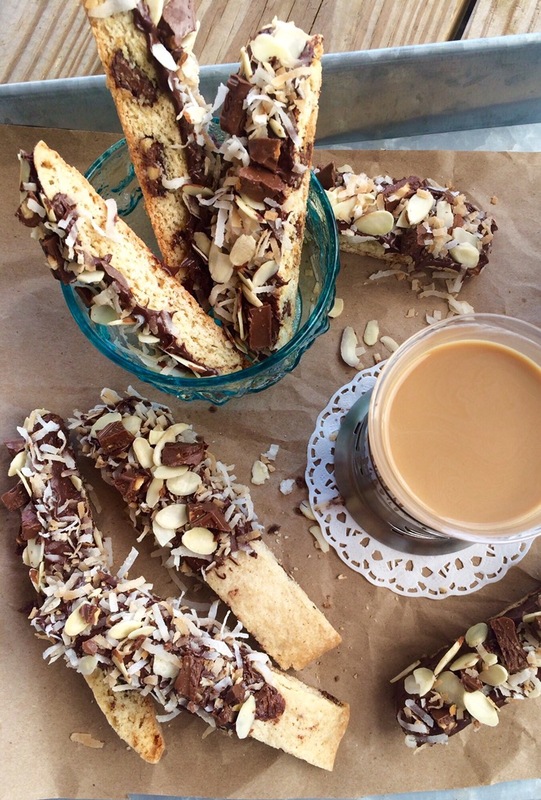 Cool the biscotti completely before dipping. Melt the chocolate in the microwave. Melt in 30 second increments; stirring after each increment. After the chocolate is melted, dip each biscotti cookie in the chocolate and immediately sprinkle with desired toppings. Lay on a sheet of parchment paper for the chocolate to set. Enjoy! 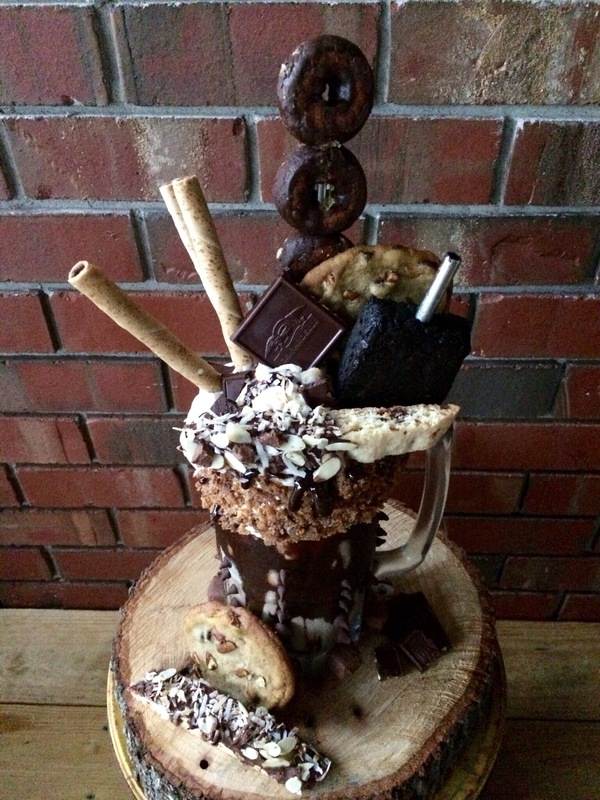 This recipe was used to decorate my Insane Milkshake.